On Dec. 14, Twilight Zone by Monster Mini Golf held its grand opening celebration at Bally’s Las Vegas. On Dec. 14, Twilight Zone by Monster Mini Golf held its grand opening celebration at Bally’s Las Vegas. The 10,000-square-foot miniature golf course features an 18-hole, arcade, Syfy Wedding Chapel, special event space, bowling and a co-branded gift shop. To kick off the event Monster Mini Golf, founder Christina Vitagliano handed guests keys to see which lucky earthling would unlock the door to the fifth dimension. Rebecca Robinson from Geismar, La. had the lucky key, earning a Twilight Zone by Monster Mini Golf prize package that included her likeness being immortalized into the walls of the Twilight Zone Venue, a lifetime of free golf at the attraction and a three-day, two-night stay in a Grand Suite at Bally’s Las Vegas. Under license by CBS Consumer Products and true to Monster Mini Golf design, the glow-in-the-dark venue features props entirely conceptualized by Vitagliano and her team as inspired by the hit television show. The venue is Monster Mini Golf’s second Las Vegas location. A KISS-themed course is located in the Rio. Pricing is free to enter the The Twilight Zone by Monster Mini Golf, with mini-golf available at $11.95 and $9.95 for Las Vegas locals. 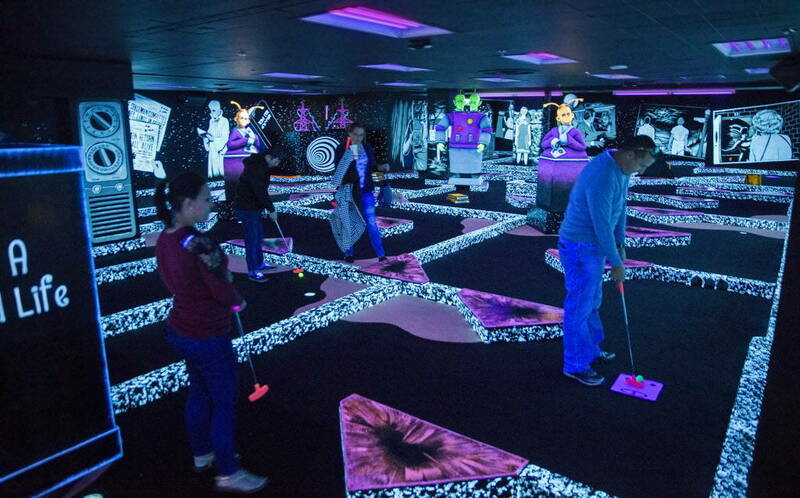 Monster Mini Golf operates 30 indoor glow-in-the-dark monster themed entertainment centers across the country. This year it relocated its headquarters to Las Vegas. Ballard Spahr — a national law firm with more than 550 attorneys across the United States — has relocated its Las Vegas office to the top floor of One Summerlin. The new office address is One Summerlin, 1980 Festival Plaza Drive, Suite 900. The new, Class A office space is in the main building of Downtown Summerlin. Ballard Spahr established a Las Vegas office in 2006 that has grown steadily since then, offering sought-after counsel in commercial litigation, business transactions, real estate, regulatory compliance and government relations. Ballard Spahr’s new office is off the Las Vegas Beltway in Downtown Summerlin, a vibrant outdoor mall with more than 100 stores and restaurants. Located not far from Red Rock Canyon National Conservation Area, the office is also near the Vegas Golden Knights’ new ice hockey practice facility and adjacent to the planned site of a new stadium for the Las Vegas 51s Triple-A minor league baseball team. Ballard Spahr’s Nevada-based attorneys advise clients in securities, mergers and acquisitions, tax and other business transactional matters as well as corporate governance, technology and data privacy issues. The firm’s litigators in Las Vegas handle all types of commercial and business disputes, including consumer financial and corporate governance cases. The Las Vegas office gaming and licensing practice focuses on licensing, structuring, investigations, and regulatory proceedings and compliance issues. The firm’s real estate attorneys in have helped shepherd some of the Las Vegas area’s most significant development projects and represent clients in virtually every type of property-related matter — spanning development, financing and litigation. For more information, visit www.ballardspahr.com.